Microsoft has launched its Office 2013 suite and with it comes the movement to cloud based organisation and the ‘metro’ interface to compliment Windows 8. The new office suite has also added social channels to its sharing option. One of the biggest changes to the way Office will be distributed, instead of the traditional one payment for one system design, Microsoft will allow you to rent their Office 365 package for a monthly or yearly fee, depending on how you prefer to pay. Adobe started this a while ago with their CS service and we believe Microsoft see value. The subscription version comes with Office 2013, including Word, Excel, Powerpoint, Onenote, Outlook and Publisher, along with Office Web Apps, 20GB of storage of SkyDrive cloud storage. The suite can also be added onto up to five PCs and these can be changed. Access is one of the only programs unavailable on the subscription model, for that, you need to buy professional office. Microsoft are obviously trying to push everything to cloud and tablet based computing. Swiping and touchscreen gestures are available and work pretty well if you have a good setup. Office will come in full version to the Surface Pro, we are unsure about Windows RT. Office 2013 Professional costs $399, Home & Student costs $140, Home and Business costs $220. All these can be added to more than one system and include cloud based storage and cloud based syncing. 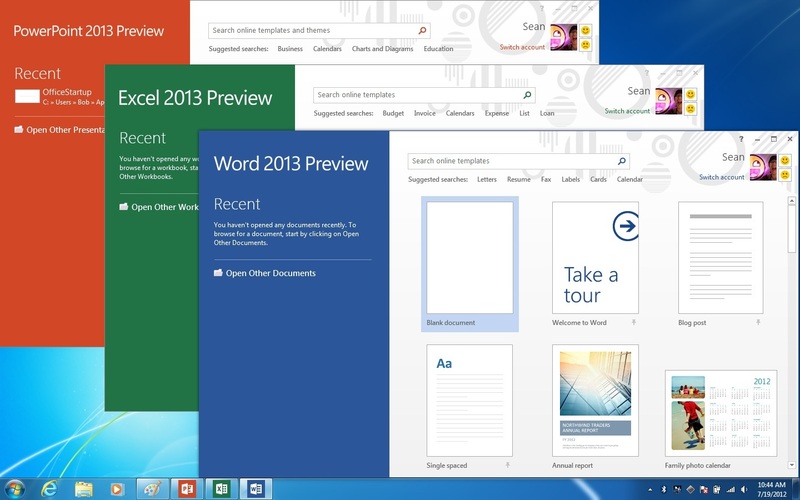 Microsoft is banking on Office 2013 not becoming an unwanted application. Millions still only use Word and Powerpoint for processing and presentations, they don’t know any good alternative. While Microsoft expand their horizons, they still have a pretty solid operating system and office suite, until they are challenged by genuine competition they still have a powerful and well funded business model.